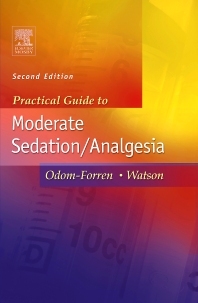 When it comes to managing the care of a patient receiving conscious sedation/analgesia during a short-term therapeutic, diagnostic, or surgical procedure, this easy-to-follow book is an ideal clinical reference. It covers everything you need to know - from practice guidelines for administering sedation, to pre-sedation requirements, intra-procedure monitoring and documentation, and discharge criteria. Detailed sections discuss the basic concepts of medications, administration techniques, potential complications and emergencies, monitoring parameters, developing a credentialing program, legal implications, and patient discharge, as well as separate chapters on pediatric and geriatric sedation. The book also provides practical learning tools such as sample documentation forms, learner feedback, and questions and answer sections. Thorough content provides all the key, essential information needed for a complete understanding of moderate sedation/analgesia in practice. Detailed sections address the basic concepts of medications, administration techniques, potential complications and emergencies, monitoring parameters, developing a credentialing program, legal implications, and patient discharge. Learning tools focus on practical implementations, such as sample documentation forms, learner feedback, and questions and answer sections. A chapter on Pediatric Sedation presents the latest techniques and recommended guidelines for the proper management of this special population.